You need to attract new customers to your ice cream shop consistently if you want to stay in business. Because as you know, if you own a frozen dessert business like an ice cream or custard shop, there is a lot of competition out there in your marketplace. And since it is such a popular business nowadays, there are more and more shops popping up every year. For that reason alone it’s getting tougher to attract new customers into your ice cream shop and keep them coming back. With the increased competition it’s getting harder to stand out and distinguish yourself from those competitors, but there are still a few things you can do to differentiate yourself from the other shops in the area. What’s going to get customers out of their homes to come and visit you? Make it a fun destination for the family. You’re not just serving a frozen dessert or ice cream, you’re giving them an experience…or at least you should be. This could mean you’re offering additional activities for the family such as games, a photo booth or specialized outdoor seating. Whatever it might be to differentiate yourself a little is better: remember people can get ice cream anywhere. Give them a reason to get ice cream at your shop. Eating healthy is a big trend and will only continue to gain momentum. As this dietary shift takes place you should be taking advantage of it by offering healthier snacks or at least a product that may fit that consumers needs. Whether you start producing vegan ice cream or organic frozen dessert, this not only allows you to differentiate yourself from the others but you will serve a whole new niche of customers. Also, people are becoming more aware of what ingredients go into their food. You can really cater to this market by using locally sourced, fresh ingredients for your products. Just make sure you let your customers know just how meticulous you are with your fresh, local ingredients. You might have the best ice cream in the world but if nobody can find your shop then it won’t matter. Being found isn’t just about your store front and location, it also refers to being found online. If you don’t have a sign out front of your business telling people exactly who you are and what you sell then you’re losing customers daily. You need to take advantage of any street traffic and foot traffic you can and that could include some way finding signs if you’re not on a busy road, plaza or intersection. If you are in a high traffic foot area or plaza then make sure you have directions and signs pointing to your shop so people know where to find them. More important than just physical signs is your internet presence. If you’re not being found online for your local area on Google then you’re going to have problems attracting customers. People search online everyday whether that be on their phones, tablet, computer or a voice search through Amazon Alexa. Long story short; you need to do some Search Engine Optimization (SEO) on your site so that your shop comes up first on any search listing in your local area. Separate from SEO but just as important to getting found is your social media presence. You should have a branded network across all social media platforms and constantly maintain and update them as well. What makes your town, city or area unique? You should try to capitalize on any local tradition, fact, attraction local to your town alone. When people visit from another area they want something different then what they get at home or in their hometown. Try to offer something truly unique that represents your local area. For instance if your town has it’s own chocolatier then you can offer their chocolate in your shop either as a topping or in some other creation. You can also consider the culture of your town and base products around that. For instance if your town is known for its history then perhaps you can create an item on your menu that revolves around a historical fact or the like. Whatever attracts customers to your town can be used in your shop to get new customers and keep them coming back. 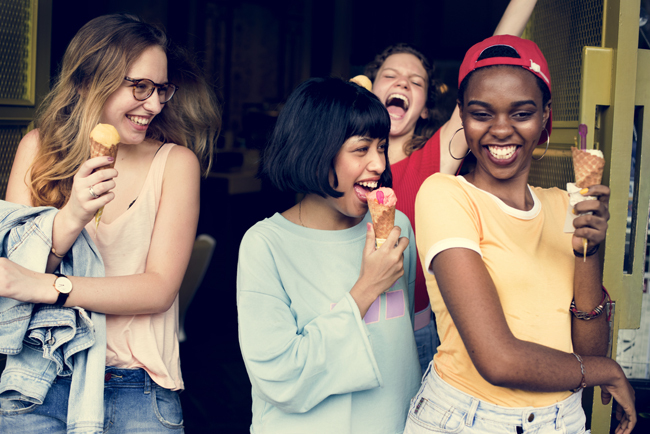 It’s probably likely that there are other businesses in your town that you can partner with or work with to attract new customers into your ice cream shop. For instance if there is a hotel or conference center nearby then go introduce yourself and hand out cards or coupons so people know about your ice cream shop. What about museums, libraries or tourist attractions? Don’t forget about any non-profits in your area that you can approach and partner with on functions. Your business is part of the local economy and many times forms a symbiotic relationship with other business that can piggyback on one another. People can’t stand to be disconnected nowadays so make sure your store is WiFi hot spot. Having WiFi available to customers will not only attract more but keep them in the store longer increasing their chances of spending more. People, especially the younger generation will want to hang out in your store because of the WiFi. Offering this service also benefits you because it can help your social media presence. If you have it set up where people can check in on Facebook or update on Instagram then it benefits you the most. Though this list could go on for quite a while with other techniques and ideas to get people into your store, we’ve given you enough ideas to implement before moving on. If you do need additional help in bringing customers through the door then contact us and we’ll be happy to consult with you.